Tell us a little bit about yourself: I live in Rock Hill, South Carolina and I am a Sgt. Detective at a local Police Department. I'm a Round Rock Dragon Alumni and I graduated from Texas State University in 2009. I am happily married and have an energetic two year old running around. I enjoy outdoor activities, golfing, and working out. My style of training is more of the conventional weightlifting. I use a lot of compound movements coupled with a few isolated exercises. I also focus on flexibility and range of motion. I also try to run at least twice a week for my cardio fix and to train for 5k, 10k and combination races. How would you describe your fitness/strength level, currently? I am two years removed from shoulder surgery (torn labrum and bicep tendon), so I am still trying to regain strength that I lost during my recovery period. I am not stronger than what I used to be, but I am in the best shape of my life. I am able to workout on a regular basis, while giving my full attention to my daughter and wife. What are your fitness/strength goals? My fitness goals are to keep getting stronger and to surpass my PR's in both the weight room and the road races times. The ultimate goal to stay fit and lead a healthy lifestyle. Describe your garage gym: I was lucky to find a house with a two-car garage so I was able to designate an area for my personal gym. The main staple of my gym is the squat rack from OneFitWonder and my Wonder Bar Barbell. I use these pieces for my pull-ups, squats, presses, pull-downs and a base for my OneFitWonder Strength Bands. I also have a set of Power Block dumbells, a pair of 60 lb dumbells from Fringe Sport, several bumper and Olympic plates, a land-mine, preacher bar, and a tricep and lat pulley. Who works out in your garage gym? Just me at the moment. Sometimes I have a special guest join me when I do my post-workout stretches as my daughter will pick up the one pound weight and lift it up and down. Why did you build a garage gym? I built my garage gym for several reasons, but the main reason was to be able to spend time with my family more often. Instead of traveling to and from the gym, wasting an hour, I'm able to wake up, go straight to lifting weights and stay focused. I love to workout and love being with my family; I am now able to do both on a daily basis. I'm also able to several different movements without waiting for equipment and get to blast my choice of music. What’s your favorite piece of equipment in your garage? Besides the OneFitWonder squat rack, I absolutely love using the Fringe Sport strength bands on a daily basis. With these bands, I am able to get a good pre and post workout stretch in, especially for my shoulders, and I'm able to add resistance to certain flexibility-concentrated movements. What piece of equipment was a waste? Every piece of equipment that I have purchased was a deliberate acquisition to obtain my goals. To the 1 lb. dumbbell during my shoulder rehab to the arm blaster to do curls for the girls. Every piece of equipment I have obtained has a purpose. What’s the next piece of equipment you’re going to get? I would like to purchase a couple of kettle bells to expand my workout routine and to use for some shoulder stability exercises. Any dream piece of equipment? My dream is to own an Assault Air Bike one day, but I might have to settle for a cheaper Airdyne bike instead. 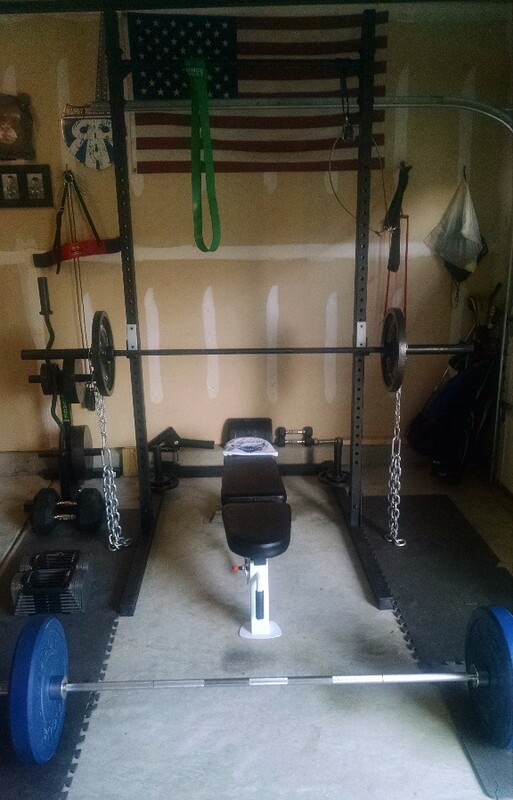 How did you build your garage gym? At our first house, we only had a single car garage. After I completed my rehab and grew tired of Planet Fitness (yes, that Planet Fitness), I purchased bumper plates, Olympic plates, a land-mine, and used barbell. It was my first taste of freedom by being able to get a meaningful workout in the comfort of your own garage. We eventually moved and bought a house with double the garage space. Right off the bat, I purchased the squat rack, a new barbell and the rest of the bells and whistles. I was like a kid at Christmas whenever I set up my gym. There are a few modifications to be had still, but all in good time. Do you have any tips for anyone else looking to build a garage gym? Just go for it. For me, budget was a big deal, but I was able to start small and eventually built my gym up to what I want it to be. Having the freedom to workout from home is unlike any other. It's a liberating and gratifying experience. Happy lifting!